Nationalism, check. Content-driven cinema tag, check. Republic Day-release, check. Big movies clashing at the box office, making an otherwise mundane Friday that much more exciting, is not new. Shah Rukh Khan’s Raees and Hrithik Roshan’s Kaabil clashing, and crashing the former’s overconfidence was legendary. Then Uri: The Surgical Strike and The Accidental Prime Minister battled it out recently, where the latter pretty much bowled underarm for the former to shine. So why is Manikarnika: The Queen Of Jhansi and Thackeray clashing this Friday be significant enough to even dedicate a page to? Well, because they are basically two sides of the same coin. If there’s one thing a Bollywood release calendar teaches you, it’s that ‘desh bhakti’-wale movies always need to be placed strategically around Republic Day and Independence Day weekends. Somehow, nationalism is bi-yearly. It, therefore, makes perfect sense that both these films — driving home a sort of aggressive nationalistic feeling — would release this Republic Day weekend. A designated holiday ensures packed theatres, ‘sarfaroshi ki tamanna‘ and hence, ringing cash registers. Win-win for the makers. The audience for both these films are different, a sceptic might interject. Furthermore, Nawazuddin Siddiqui and Kangana Ranaut have branded themselves as the ‘outsider’ who made it big in Bollywood, all on their own. Both have placed themselves as ‘different’ in the accepted template of ‘hero’ and ‘heroine’ in Bollywood. Both struggle with the kind of suave English one associates with the Koffee With Karan kind of people. Yet, both have slowly and steadily climbed the social ladder, simply by virtue of their good work. So, if there’s glittering nepotism on one side, there’s Nawaz and Kangy on the other — the strong but not silent self-made. Come to think of it, even the brand of nationalism depicted in the two films is similar. Rani of Jhansi, Laxmi Bai was fighting the enemy. Bloodshed and collateral damage was obvious. Balasaheb Thackeray, too, was fighting who he thought was the enemy — at least that’s one way to look at it. Bloodshed and collateral damage, again, was obvious. She’s a Shiv bhakt, he’s the Shiv Sena. Diving right into the content, let’s just say that ‘Maratha’ and Uttar Pradesh both feature well in both the films. Born in a Marathi household, Laxmi Bai was married into the princely state of Jhansi, now a part of Uttar Pradesh. 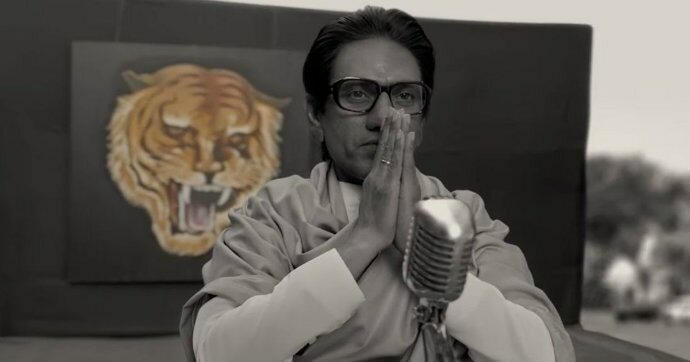 Balasaheb Thackeray was known for his ‘love’ for the people of Uttar Pradesh — very few actually were able to understand that all he wanted was for them to stay there and help it prosper! Again, that’s just one way to look at it. So, in conclusion, there’s really no clash. Perhaps for the first time in the history of Bollywood, no matter which screen the humble Indian steps into, they will be watching the same film — with the only difference of a man or a woman headlining it.